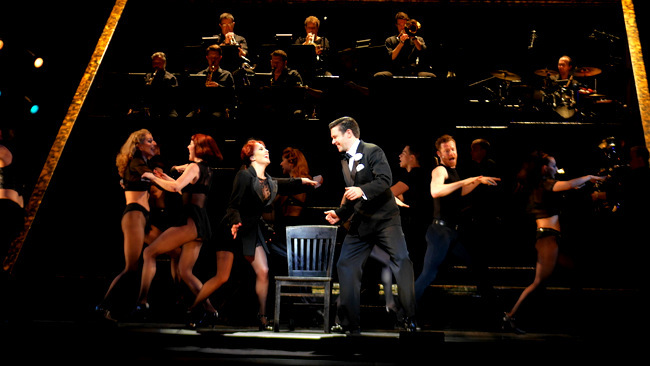 CHICAGO The Musical dazzled Mastercard Theaters on its opening gala night. It is no surprise why Chicago The Musical is one of world’s most popular. Sensational dance numbers aside, the catchy tunes journeys theatre-goers through the decadence of the 1920s with a whole lot of cynicism, sass and style. The devilishly delicious show opened to a packed house last night, all cheering to Lindsey Tierney and Genevieve Nicole’s entrancing performance as Roxie Hart and Velma Kelly. Chicago follows the story of Roxie Hart, a bored housewife to a less-than-stellar mechanic, Amos, and a night-club dancer with dreams of a Vaudeville stardom. When her on-the-side lover threatens to leave her, she murders him and begins a whole chain of events to avoid conviction with the help of Billy Flynn, a lawyer of questionable ethics. During so, she meets Velma Kelly, a cell mate jealous of Roxie’s new found stardom of sensational headlines, stealing the chance of her own Vaudeville spotlight. While you may think that Chicago is just another raunchy number, but nothing is always as it seems. The show makes the audience take a clear look at how we consume media and how we view the infamous as celebrities against the backdrop of changing views on women during the Jazz age. What’s eerily scary is how much it reflects our current day and age. It entertains, all while making our brains fumble with the harsh truth. And, if there was one performance to sum this up, it would be the duet between Matron “Mama” Morton and Velma, Class. The irony as they lament over the lack of fine morals (of Roxie and Billy), when they were the first to “get the ball rolling” had audiences chuckling at every verse. No doubt, the powerful ensemble was most important in bringing across each laughable sequence. I still could not forget the strong, booming falsetto of Mary Sunshine from her appearance to his exit. Perhaps it was Billy Flynn and his entourage of dancers in All I Care About or when he puppeteer-ed poor Roxie in We Both Reached For The Gun. I fell into the world of jazz, opening up a whole new genre of music for me. It got me wanting to get on my feet for a clumsy (and hilarious) take on their captivating dances. Whether you are a jazz lover or not, Chicago is sure to delight. It marks all the ticks for a feel good night out at the theaters, with their songs on repeat on your Spotify for days to come. So, put on those dancing shoes and check out the show while it is in town. Chicago The Musical will run from 8 to 26 February 2017 at the Sands Theatre, MasterCard Theatres at Marina Bay Sands. Ticket prices start from S$68 (excluding S$4 booking fee), and can be purchased here.